COPENHAGEN, Denmark ― Denmark plans to significantly increase defense spending and refocus its military and operational capabilities on the Baltic Sea and the Arctic High North. The government plan ― detailed in the Ministry of Defence document “Proposal for new defense agreement 2018–2023“ ― is directly influenced by Russia’s “more confrontational” behavior and strengthening military presence in the Baltic and High North regions. Denmark has allocated $3.5 billion for its defense budget in 2017. The defense proposal, if implemented, would scale up year-by-year spending and increase the military’s annual budget by $770 million to $4.27 billion in 2023. “The government’s defense deal proposal marks a substantial investment in Danish defense. A strong defense underlines our determination to remain a core nation in NATO,” Danish Defence Minister Claus Hjort Frederiksen said. In a move that will please the U.S. and NATO, the MoD is proposing to grow its defense spending by 20 percent over the next six years. The effectiveness of the U.S. and its NATO allies to act as deterrents against Russia is at risk because of shortfalls in capability, said Lt. Gen. Ben Hodges, commander of U.S. Army Europe. A substantial part of proposed new spending would be directed at weapons systems’ acquisitions, special forces expansion and enhanced preparedness-based capacity-building across the naval, ground and air services. “Denmark needs to build better military capabilities. The larger budget set out in the defense proposal is also intended to enable Denmark to provide a deeper commitment to NATO and contribute more to the alliance’s collective deterrence and defense,” Frederiksen said. The Danish government is scheduled to present a completed defense policy initiative to the leaders of the country’s opposition political parties by the end of October. The proposal will form the basis for new plans to transform Denmark’s military organization into a leaner and operationally oriented structure equipped with greater firepower and fighting capabilities. The establishment of a “Total Defense Force” ;remains the cornerstone of Danish defense policy and strategy under the new proposal. To this end, the defense proposal contains an unprecedented level of both ambition and commitment to strengthening Denmark’s land, sea and air capabilities. The Navy’s frigates are to be equipped with both short-range and long-range missiles to counter hostile aircraft and missiles, while offering improved protection of Danish airspace. The investment proposal linked to the 2018–2023 capacity-building initiative includes the establishment of a 4,000-strong, medium-heavy “rapid” deployment brigade. Moreover, programs are to be implemented to modernize anti-submarine warfare capabilities along with frigate air defense systems and capacities. The establishment of a new brigade, which the MoD hopes can be fully operational in 2024, would run parallel to the reorganization of Danish defense forces. The proposed brigade would be given additional enhanced capabilities, including more battle tanks, ground-based air-defense, anti-tank weapons, and artillery systems. The brigade, which is envisaged as operating as an independent unit with its own command structure, would have the capacity to be deployed by the country’s defense forces to the Baltics in a time of crisis. 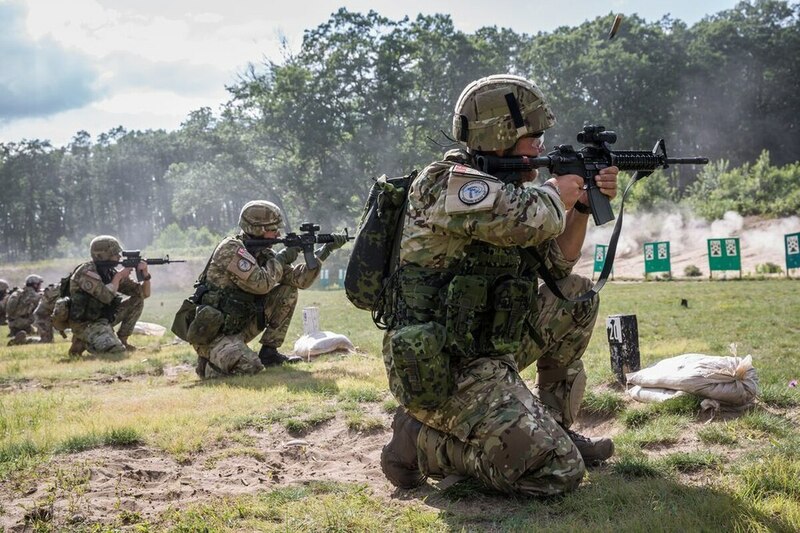 In such a scenario, Denmark could become a staging area for reinforcements from NATO allies sent to the area to protect the sovereignty of the NATO-aligned Baltic-rim states Estonia, Latvia and Lithuania. Further capacity-building programs are earmarked to cover the acquisition of unmanned aerial systems for intelligence, surveillance and reconnaissance, in addition to the development of a much-expanded, military-led cyber defense capability. The defense proposal, said Frederiksen, is in line with existing policies to construct combat military units and capacities that can quickly be deployed in support of NATO members and other allies. The emphasis, he said, would be on improving operational capacities. “Danish defense capability, since the end of the Cold War, has been developed to be an expeditionary force that can operate far from Denmark to fight terrorism together with troops from other countries,” Frederiksen said. The defense proposal has received a cautious welcome by most opposition party leaders. Some parties are looking for a higher level of spending and more resources to protect Denmark’s extensive territorial interests in the Arctic region, including Greenland. Any effective defense plan must comprise policies and measures to deal with Russia’s military strengthening in the Baltic Sea and High North, said Henrik Dam Kristensen, the Danish Social Democratic Party’s defense spokesman. “Russia is deploying missiles in Kaliningrad close to our border. These missiles can easily reach Denmark. We need effective measures to counter this threat. The buildup of Russian troops along the borders of the Baltic states also poses a destabilizing risk to security in this region,” Kristensen said.